Creating Exercise Habits The beginning of the year is often a time when many people commit to a New Year’s resolution. Research indicates that approximately 45% of the population commits to at least one resolution, but of those that do, the vast majority have abandoned it by Valentine’s Day! Common New Year’s resolutions are committing to weight loss and starting an exercise program. The fact that many people put on extra weight during the holidays can be an added motivation to create a new exercise habit. So what is it that makes these self-promises so hard to keep? All too often our initial enthusiasm and energy wanes. We get distracted by other things going on in our lives, or we do not think we are seeing results quickly enough, and we throw in the towel. 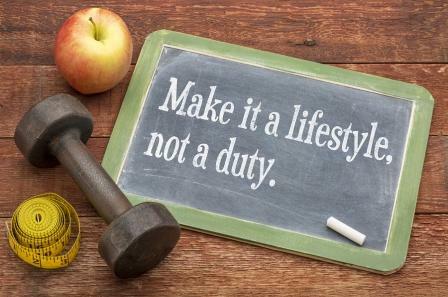 Many people do manage to hang in there and make exercise a lifetime habit, and you can too! A recent study by researcher Diane Klein, PhD, shed some light on the subject. Long-term exercisers (those working out for an average of 13 years) were asked to rank what motivated them to keep up with their regimes. Primarily the exercisers were not as concerned with specific physical goals, like being toned, or having bulging biceps, as they were with feeling good and being healthy. How do we become one of the fitness faithful? Check out the following hit list to help create positive fitness habits.